Nowadays, organisations must cope with the pressure of cost reduction and efficiency in order to succeed in a highly competitive business environment. However, drivers to improve social interaction and employee’s performance and as such to contribute to organisational goals and objectives make it necessary to be concerned with other performance criteria as well, such as effectiveness, flexibility, employee satisfaction, productivity and creativity. There is a growing need for performance management and performance measurement that not only covers all aspects of an organisation, but which can be applied to various situations in a changing internal and external environment. Performance measurement methods which include an integrated perspective of performance have become essential. In addition, it has been realised that corporate real estate can contribute to organisational performance (Nourse and Roulac, 1993, De Vries et al., 2008, Lindholm, 2008, Den Heijer, 2011, Jensen et al., 2012). For this reason, worldwide organisations started to implement new ways of working in a more open and flexible work environment. Although there are various objectives and drivers of workplace change, the common objectives are to reduce costs and to increase efficiency. The changing organisational and external contexts, such as the increasing demand for talented knowledge workers and changing work patterns, have led to the development of new offices that can promote social networks and interaction among employees. The new workplace does not only aim at achieving cost efficiency, but it should also support employee satisfaction and productivity. This PhD research focuses on both themes i.e. 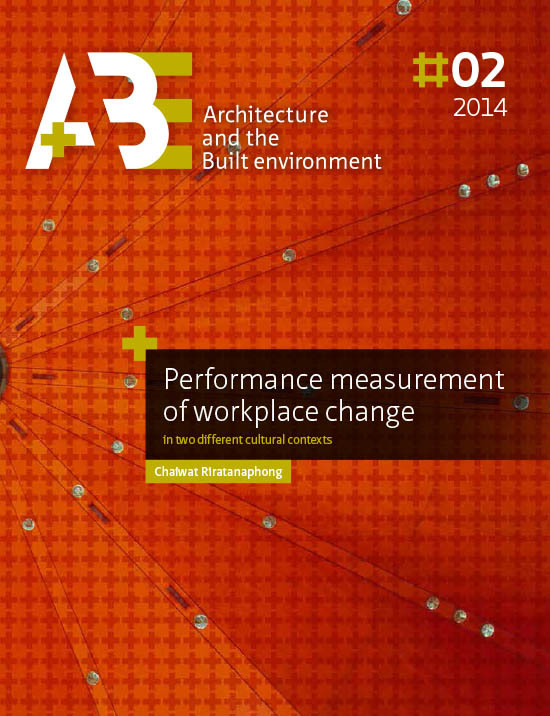 performance measurement of workplace change. The aim of this research is to provide a conceptual framework that visualises the impact of workplace change on employees’ responses to the new work environment and to present guidelines on performance measurement of workplace change in different contexts. Two organisations in Thailand and one organisation in The Netherlands were selected to serve as case studies. The impact of culture was explored as a contextual background. Based on literature review an overview of performance measurement systems and measures has been developed. The list of corporate real estate performance measures has been classified in six categories according to Bradley (2002) and subsequently compared with the findings from the case studies. The six categories include: 1) stakeholder perception, 2) financial health, 3) organisational development, 4) productivity, 5) environmental responsibility and 6) cost efficiency. The impact of workplace change was examined using the work environment diagnosis instrument (WODI) questionnaire which evaluates employees’ responses to the changed work environment in three areas: employee satisfaction, perceived productivity support and prioritised aspects (Maarleveld, et al., 2009). The Organisational Culture Assessment Instrument (OCAI; Cameron and Quinn, 2006) was used to assess organisational culture. National culture was measured by using the Value Survey Module 94 (VSM94; Hofstede, 1997). The conceptual framework that came to the fore from the literature review showed to be useful for both theoretical understanding of performance measurement and practical applications. Proposed performance measures have been applied in all three case studies but in different ways. The three case studies showed that performance measurement of an organisation is multi-dimensional. It includes several performance criteria and performance measures beyond cost efficiency. All seven performance criteria mentioned by Sink and Tuttle (1989) have been applied in all three cases including effectiveness, efficiency, quality, productivity, quality of worklife, innovation and profitability. The four perspectives of the Balanced Scorecard (financial, customer, internal business process, learning & growth) are applied in all three cases as well, with different points of focus regarding their business types. The corporate real estate performance measures found in the case studies and classified in the six categories can be aligned with most of the areas of the added value of CREM in the literature and can also be viewed as value dimensions. In all three cases, the performance measures related to human resource management were focused on the occupiers having been provided with an office environment that enables employees to increase their productivity. The findings show that organisation and workplace change characteristics have an influence on the satisfaction of employees. The physical characteristics of workplace change that have influenced different degrees of employee satisfaction include location, building grade, architectural design, workplace concept and supporting facilities. The findings also show a negative impact of workplace design on perceived productivity support, due to the miscalculation of the users’ needs and preferences during the implementation process. Furthermore staff characteristics, the work process and work patterns showed to have an effect on which work environment aspects employees perceive as being most important. Regarding the impact of culture, the findings show that the dominant organisational culture types obtained from the organisational culture survey have been influenced by the structure and staff characteristics of the case organisations. The data from the national culture surveys that were conducted in the case studies show large differences in comparison to the findings from the studies by Hofstede (1997). These differences can be explained by the organisational context. The cross-case analysis led to several conclusions: • The relevance of corporate real estate performance measures depends on different stakeholders, and different real estate and managerial levels. • The study confirms that measuring employee satisfaction of the work environment can be used as a means to measure organisational performance. • The empirical findings confirm the relevance of the variables shown in the conceptual model of workplace change appraisal and the integrated conceptual model that connects organisational characteristics and characteristics of work processes to objective and subjective performance measurement indicators. • The findings show that information about organisational and national culture is vital for the interpretation of workplace characteristics and the appraisal of change. • The study shows that neither organisational nor national culture has absolute dominance in the employees’ appraisals. • The findings proved that national culture data from Hofstede cannot be generalised to organisations; on organisational level huge discrepancies were found with employees’ between scores on cultural dimensions and national culture indices. These conceptual frameworks on performance measurement and employees’ appraisals of workplace change can be used as a reference to provide input for further improvement of performance measurement and performance management. Many variables such as staff characteristics, work process, cultures and workplace characteristics simultaneously impact the performance measurement of workplace change. The relevance to performance management is that the organisations should be aware of the possible relationships between variables in the integrated conceptual model which could have an impact on performance measurement. The role of real estate that exceeds an operational asset focusing cost efficiency to also include a strategic resource contributing to other criteria of an organisational performance has been shown in this study. A step-by-step plan for prioritisation of corporate real estate performance measures and KPIs has been introduced as a means to find a balance between the costs of measuring and the benefits of being able to manage corporate real estate efficiently and effectively and as such to contribute to achieving organisational objectives and to supporting the core business and organisational performance. The empirical studies include a combination of both qualitative and quantitative methods. The qualitative data from the case studies which were analysed inductively helped to understand workplace change phenomenon, to clarify the relationships between the variables in the conceptual framework of workplace change, and to answer the research questions formulated at the beginning of the thesis. So far, the quantitative data from questionnaire surveys were used to explore the relationships between employees’ responses to workplace change and organisational and national culture in a qualitative way. The collected data can be used for further exploration of complex relationships by statistical analysis. Triangulation of data collected from different sources (documents, surveys, interviews) helps to validate the findings through cross verification, i.e. reduce weakness or intrinsic biases from the researcher’s background knowledge. The assessment of both tangible (physical characteristics) and intangible components (perceived quality) of the office environment can help to validate the findings from the empirical research. This research study is an exploration of performance measurement concerning workplace change in different contexts. The conclusion of this study is based on the findings from two Thai cases and one case in the Netherlands. Although there are assumed cause-effect relationships between the variables in the conceptual models, more case studies are needed in order to collect comparable data that support the findings of this kind of research.